Paros, Greece 2013 Workshop (25 August—13 September) | To walk through walls is to transcend the barriers we place on ourselves. 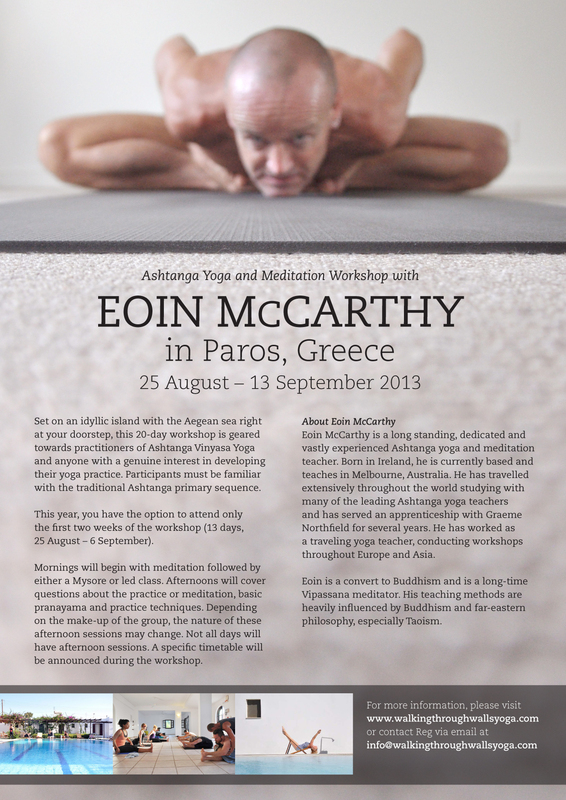 Set on an idyllic island a stone’s throw away from the Aegean sea, this 20-day workshop is geared towards practitioners of Ashtanga Vinyasa Yoga and anyone with a genuine interest in developing their yoga practice. Participants must be familiar with the traditional Ashtanga primary sequence. Please note that this workshop is not suitable for complete beginners. This year, you have the option to attend only the first two weeks of the workshop (13 days, 25 August—6 September). Mornings will begin with meditation followed by either a Mysore or led class. Afternoons will cover questions about the practice or meditation, basic pranayama and practice techniques. Depending on the make-up of the group, the nature of these afternoon sessions may change. Not all days will have afternoon sessions. A specific timetable will be announced during the workshop. Self-contained studio apartments which can accommodate up to 4 people and includes 2 rooms, one with a double bed and the other with 2 single beds, a bathroom and kitchen. Single rooms for 1 person. A share kitchen is accessible to those staying in the single rooms. Travel to Paros is either via plane or ferry from Athens. To travel by plane generally takes approximately 35 minutes or by ferry it can take from 2 hours 45 minutes (high speed ferry) to 5 hours (with the classic ferry). You can either take a taxi or hire a car from the airport or port to the hotel. You can also take the bus to Naousa and take a taxi from there. For more information, please email parissikaterina@gmail.com. We ask that all participants be at Elen Hotel by 5pm on Saturday, 24 August 2013. Many visitors to Greece will not need to obtain a visa for visits to Greece of up to 90 days. This includes citizens of all other European Union countries, Canada, Australia, Japan, and the United States. These days, as security arrangements change rapidly, visa requirements can also change. Please verify your needs directly with the local Greek consulate in your nation of origin. If you’re flying directly to Greece, your airline may also be able to tell you if a visa is required, but it is best to verify visa requirements for Greece with the Greek embassy or consulate in your country. The currency in Greece is Euro. Paros, the second largest island of the Cyclades is well-known as the beauty queen of the Aegean. It offers beautiful landscapes, golden sandy beaches with clear water, small traditional white villages with cubic houses, fishing harbours, churches and archaeological sites. Paros is also famous all over the world for its ideal weather conditions for windsurfing. This entry was posted in Workshop by reg. Bookmark the permalink.